designboom in collaboration with Lexus present the LEXUS DESIGN AWARD 2018. Participation is open to professionals, students and design enthusiasts from every country in the world and only to individuals who have reached the age of majority. Free registration required. Information on how to enter and prizes form part of the Official Rules, please read them carefully before entering. Below we summarize the most important steps. 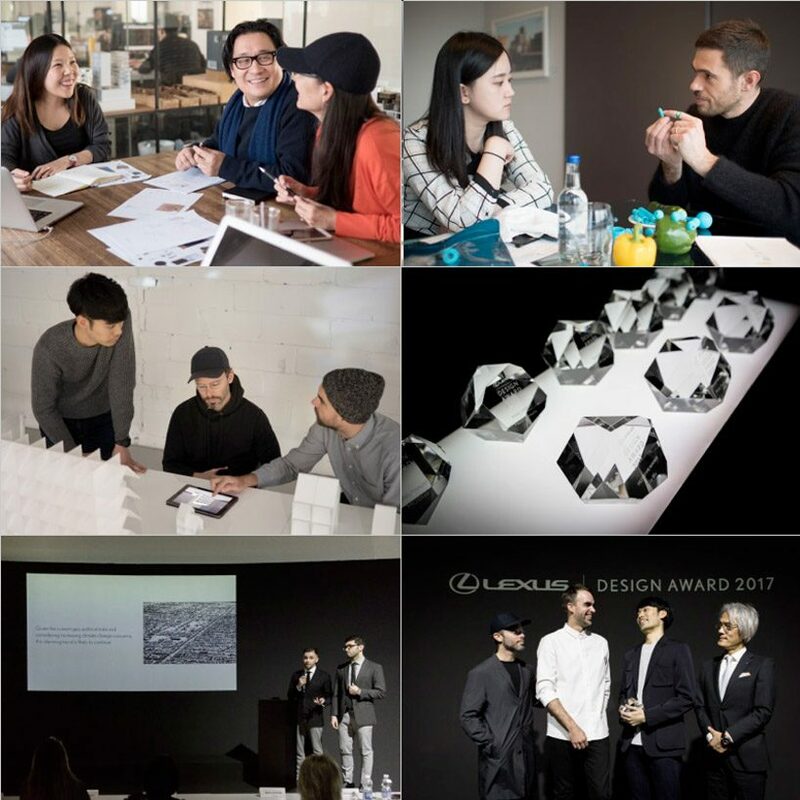 Lexus created the LEXUS DESIGN AWARD, an international design competition, to help support the next generation innovators who produce "DESIGN" to enrich our world. The award seeks entries from around the world and opens the call for entries for the 6th competition on (Mon) July 24, 2017. Lexus was launched in the U.S. in 1989 as a premium car brand from Japan. As a truly global premium car brand with the vision of Progressive Luxury, Lexus has been pursuing and presenting different values from those of conventional luxury cars. We have been striving not only to create a more luxurious experience through automobiles, but also to help in solving many issues that have come along the way. Lexus thinks that "DESIGN" is a process in problem solving and a solution to shape a better society and future. 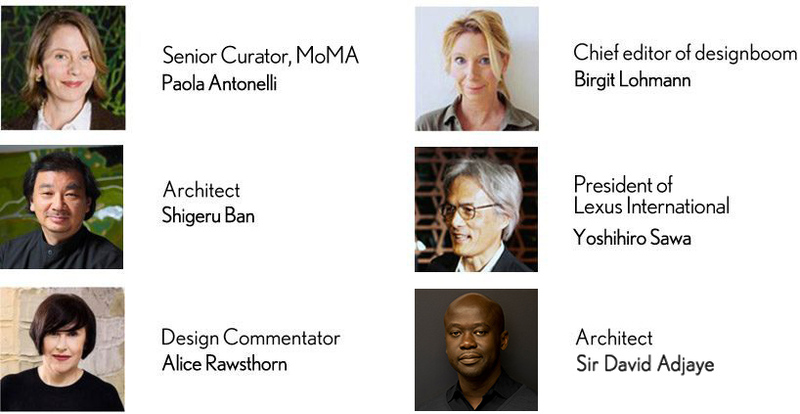 Lexus is announcing the continuation of the LEXUS DESIGN AWARD to support future creators who can enrich the world. By providing the opportunity to embody unique ideas, create and exhibit prototypes through sessions with world-famous designers as mentors, we hope to help next generation talent flourish. We welcome designers from all fields: architecture, product design, fashion. We’re looking for "DESIGN" that goes beyond the mastery of shape, form and function, and becomes a process and solution to overcome challenges. The theme for the LEXUS DESIGN AWARD 2018 is 'CO-'. At Lexus, we believe that the ultimate purpose of design is to make our world a better place. Design can be a powerful agent of change that enables us to create a brighter future. This year’s LDA theme “CO-” embodies this ideal. In Latin, “CO-” is a prefix meaning together or in partnership. This theme expresses how Lexus seeks the harmonious coexistence of nature and society through sustainable design. “CO-” is an approach that allows us to explore our potential and that of our environment by creating new possibilities through collaboration, coordination and connection. Let "CO-" inspire you to conceive a world full of hope and possibilities. Four Prototype Winners will each receive a mentorship by an acknowledged professional to develop a prototype of his/her submitted Work. The Sponsor will cover the prototype production costs up to 3 million Yen (*includes tax, customs duty, construction fee and part of a packaging fee). Prototypes will be developed through sessions with the mentors. In addition, the 4 (four) Prototype Winners plus 8 (eight) additional panel finalists will receive a 'Trip Prize' to Milan, Italy during Milan Design Week (taking place between April 16-22, 2018) and are required to attend the LEXUS DESIGN AWARD 2018 Exhibition and Ceremony, where the Four prototypes, and panel displays for the other eight awarded designs, will be exhibited. 'The 'Trip prize' includes 1 (one) round-trip between a major airport near Finalist’s home and Milan, Italy plus accommodation for 2 (two) nights. Only one individual will be invited, regardless of whether the winning entries are submitted by an individual or a group. The Prizes are non-transferable and no cash alternative is available. Please read full description of benefits in the Official Rules. The Judges and mentors will select 8 (eight) Finalists and 4 (four) Winners from the Entries received. The 4 (four) Prototype Winners will each receive a mentorship to develop a prototype of his/her submitted Work. Andrea Trimarchi and Simone Farresin are Studio Formafantasma, Italian designer duo based in Amsterdam, Netherlands. They have developed a coherent body of work characterized by experimental material investigations and explored issues such as the relationship between tradition and local culture, critical approaches to sustainability and the significance of objects as cultural conduits. Their work has been presented and published internationally and museums such as New York's MoMA, London’s Victoria and Albert, New York's Metropolitan Museum, the Chicago Art Institute, the Textiel Museum in Tilburg, the Stedelijk’s-Hertogenbosch, MUDAC Lausanne, the Mint Museum of Craft and Design in North Carolina and the MAK Museum in Vienna have all acquired Formafantasma’s designs for their permanent collections. Andrea and Simone are lecturing and heading workshops in various Universities and Institutions. Currently teaching at the ‘Well Being’ and 'Contextual Design' Departments of the Design Academy Eindhoven and they are at the head of the Design bachelor at MADE Program in Siracusa, Italy. Jessica Walsh is a designer & art director working as a partner at NYC based design firm Sagmeister & Walsh. She lectures about design at creative conferences and universities internationally and teaches design at The School of Visual Arts in NYC. Her work has won numerous awards from most major design competitions including Type Director’s Club, Art Director’s Club, SPD, Print, New York Festivals, D&AD, TDC Tokyo, and Graphis, among many others. She has been awarded Forbes “30 under 30 top creatives designing the future” and Ad Age’s “Top 10 Visual Creatives". Her work has been featured in numerous books & magazines. Clients include the Museum of Modern Art, The Jewish Museum, Jay-Z, Snapchat, Barneys, The New York Times, Levis, Adobe, and The School of Visual Arts. She hosts mentorship programs for creative women through her initiative Ladies, Wine & Design; which has spread to over 110 chapters around the world. Her blog & book “40 Days of Dating” received over 10 million readers and is currently being turned into a movie by Warner Brothers. (ii) Consistent with the Lexus DESIGN goal of making the world a better place. Application registration will be accepted by 23:59 (CET), October 8, 2017. Registration is open now, please fill in the form. Teams should register with one name only - when submitting Works, you should add all team members' names. There is no limit on the number of entries per person. If you are entering more than one Work, please submit each Work separately. Images and text must be in digital format. a. How many image files can I upload? The Work may be produced in any medium but must be submitted as low res JPEG (JPG) or GIF format. 1 main image and 1 image showing usage are mandatory, and 6 additional images are optional. Up to 8 images can be uploaded (either single or composition images). - 500 KB or smaller (a low-res version of your original Work). - Video upload is not mandatory. The voluntary addition of up to 2 video files should be uploaded as either vimeo or youtube format. then, the link of each video should be pasted in the proper field of the submission form. Please provide a brief description of your design. Let us know about your research and point out the artistic and technological qualities. You should also consider a broad spectrum of issues that demonstrate and showcase the ways in which your design can enrich people's lives. Tells us about it. Prior to submitting your Work(s), and you will be asked to agree to the Competition Guidelines. By clicking on the Submission upload button you notify that you have read and understand the terms and conditions, AND BY PARTICIPATING IN THE CONTEST, YOU AGREE TO BE BOUND BY THE OFFICIAL RULES, WHICH CREATE A CONTRACT BETWEEN YOU AND THE SPONSOR. - submitted Work must be original work by the applicant himself/herself. Except for materials that are in the public domain, each Submission, in its entirety, must be a single work of original material created by the Entrant, or for which Entrant has all rights required to comply with these Official Rules. - the Work must not be offensive, defamatory, harmful, vulgar, excessively violent, and racially, ethnically or otherwise objectionable. - it is important that you keep your design(s) confidential until the results of the Contest are published. With regard to the submitted work, Toyota Motor Corporation and designboom shall assume no responsibility whatsoever. Qualifying Submissions must be received by October 8, 2017, 23:59:00. CET. Please read the Official Rules. Prototype Winners will be chosen by the middle of December 2017 and additional Panel Finalists will be chosen around end of December 2017, and notified by email (only to the Prototype Winners and Panel Finalists, unless extended deadline). Finalists' names will be available online at designboom.com after April 2018. Please note that only the shortlisted applicants will be notified. The shortlist, Finalists and the Prototype Winners will be published on designboom.com, and Finalists and the Prototype Winners will be published on Lexus official website during/after the LEXUS DESIGN AWARD 2018 Exhibition in Milan. All Works submitted will remain the exclusive property of the Entrant. However, by submitting the Work(s) to the Contest the Entrant agrees to provide Toyota Motor Corporation with the right of first refusal to the exclusive use of the Work for commercial purposes. This option is valid for 12 months after the end of the competition. In the event that Toyota Motor Corporation exercises the option to use the rights for commercial use (incl. production) on exclusive basis and for an unlimited period, Toyota Motor Corporation will make private agreement with the Entrant for the transfer of intellectual property rights. The 4 Prototype winners and creators of the prototypes agree that they are participating in the production process in which they will receive advice and inspiration from the Mentors to finish the creation of prototypes, and that Lexus will disclose the name of the Mentors who worked with them and will disclose information about the production process in the form of text, pictures, film etc. when making public announcements about the work. designboom and Toyota Motor Corporation will have the right to use all of the Works submitted as part of the Contest, and all images depicted therein, in any promotion or for any non-commercial purpose. By submitting a Work, Entrant grants Sponsor and Producer the non-exclusive, unlimited, royalty-free, rights to publish in all media now known or hereafter discovered, and publicly display all Work for an unlimited period, and worldwide. All Entrants authorize designboom, Toyota Motor Corporation to publish and exhibit all the designs (including project data submitted and prototype) – waiving compensation – at exhibitions and events and/or to use them in any publications and communications that designboom, Toyota Motor Corporation may deem suitable and/or necessary. designboom and Toyota Motor Corporation will credit the designer's name to properly attribute authorship of Work and to promote the author adequately. Toyota Motor Corporation will have the right to apply minor change amendments without damaging the integrity of the artwork – e.g. add the LEXUS logo and text, reframing, translation, changing colors, cutting the background or parts of it, etc… In case designboom, Toyota Motor Corporation wants to bring major changes to the submitted artwork for publication, designboom, Toyota Motor Corporation will contact the designer and inform him/her about the use to obtain the designer's consent. and make sure to write ‘LEXUS DESIGN AWARD 2018’ in the subject line (English text only).